At the Region is an ongoing feature that discusses the state-by-state training, certification and employment requirements of first responder departments across the nation. 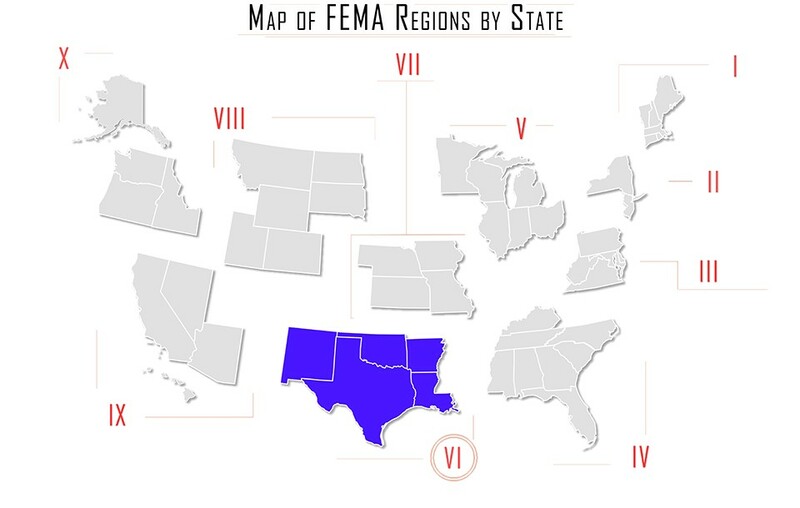 In this issue, At the Region looks at requirements for firefighters in FEMA Region VI: Arkansas, Louisiana, New Mexico, Oklahoma, and Texas. The Arkansas Fire Training Academy at Southern Arkansas University Tech, is accredited by the International Fire Service Accreditation Congress (IFSAC) and the National Board on Fire Service Professional Qualifications (NPQS or Pro-Board) to certify personnel to the Firefighter I, Firefighter II, Driver/Operator, Hazardous Materials-Awareness, Hazardous Materials-Operations, Instructor I and Fire Officer I & II levels. • Successfully complete all required Selection Procedures. • at least two (2) years of previous experience as a paid firefighter with another fire department and whose years of experience as a paid firefighter when subtracted from the person’s age leaves a remainder of not more than thirty-two (32) years shall be eligible. You must first become a volunteer firefighter and then you can attend the Fire Training Academy to become a fully certified firefighter. It is unclear if the State of Arkansas offers reciprocal certification for equivalent training in another state. Louisiana considers both firefighters and police officers in the same group of civil servants. Louisiana also uses a scheme of categorization that breaks individual departments down into either civil servant departments or non-civil servant departments. Applicants to become firefighter submit an application to the municipal service board in the town where they want to work. The board reviews applications and approves or disapproves. Those whom are approved get to take an Entrance Firefighter Exam. The exam is competitive and is handled by the Office of State Examiner Municipal Fire and Police Civil Service (OSE). It is not necessary to take the exam in the jurisdiction in which you want to work, but you must meet the requirements for the exam in the jurisdiction in which you take it. The OSE website offers great information for those wishing to apply. Here you can find applications, study guides by jurisdiction, points of contact for municipal service boards, and other great information. Make sure you read through the website thoroughly before making application. The Louisiana State University Fire and Emergency Training Institute handles reciprocity. Reciprocity applications are only accepted for applicants who are currently working for a Louisiana Fire Department, so go get hired first. Certifications that meet the requirements that the LSU program follows will be processed. Those that don’t meet the requirements will not be processed. There is a $30.00 fee payable upon approval of certification. Some New Mexico departments require firefighters to also hold EMT (minimum) licensure by the end of the recruitment period. Only EMT certification training from New Mexico or the National Registry is accepted. Also, applicants must pass Hazardous Materials, Basic Firefighter Emergency Medical Services, Incident Command and Wild land Firefighting for admission into the State Firefighters Training Academy. • The occupational level of the applicant’s current certification must also be accredited in New Mexico by IFSAC. Candidates who failed either a written or skills New Mexico certification exam earlier will not be considered for reciprocity. Reciprocity will only be granted for the NFPA edition of the original certificate. Reciprocity will only be considered for the last two revision cycles. Applicants must also pass a written examination that assess basic reading and math skills. Some departments may give former service members with honorable discharges and active-duty reservists or National Guardsmen a five-point preferential final exam score addition. Applicants must also pass a physical skill assessment and a comprehensive medical exam. Emergency Medical Technician licensure is a precondition to become employed and maintain that employment. Most local departments incorporate EMT certification training into their firefighter training. Applicant must also pass a background check that includes a full set of the candidate’s fingerprints followed by a thorough criminal history check. This may also include a polygraph test. Oklahoma State University offers International Fire Service Accreditation Congress (IFSAC) and National Board of Fire Service Professional Qualifications (NPQS) accredited firefighter training. • Candidates may only take challenge exams during scheduled certification exams. • • High School Diploma or GED equivalent. College Diplomas will not serve in place of either. • Pass a Criminal Background Check. There are several firefighter training facilities in a state as large as Texas. Texas A&M Extension Service offers a Firefighter Recruit Entry Level Academy where students undergo a 12-week program of classroom and physical hands-on training. Upon completion, cadets are eligible to earn IFSAC and Pro Board Certifications in Firefighter I, Firefighter II, Hazardous Materials Awareness, and Hazardous Materials Operations. Check with the fire certification agency in the area where you intend to seek employment to learn what qualifications are required. Reciprocity in Texas varies depending on whether the jurisdiction you previously worked for is an IFSAC or non-IFSAC jurisdiction. • Determine whether you meet any additional certification requirements. For details on reciprocity in Texas visit here.